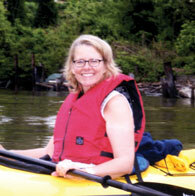 Founder of the Great Hudson River Paddle, Camilla Calhoun started a tradition that has introduced hundreds of kayakers to the river's majesty. As creator of the Westchester Land Trust's model Saw Mill River Watershed Education Program and Land Use Symposium, her programs sparked collaborative efforts in Yonkers to create the path that follows the buried Saw Mill River, bringing attention to a resource that was paved over for nearly a century. Now an art dealer, her exhibits often focus on works depicting the Hudson Valley's inspiring beauty.